Heading in opposite directions, we met in 2001, and although neither of us changed our route at the time we both had a suspicion we would end up together for the long haul. 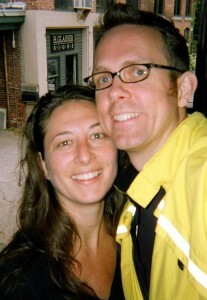 Since 2005, we’ve been scaffolding a life together. We drive each other entirely insane – equally opinionated, individualistic, and stubborn – we are formidable opponents. Yet, we are amazed by each other’s unique abilities, intelligence, love, and compassion, and together, we make one hell of a team. Serious planning for simplifying our lives began in 2008, both of us weary of the chaotic dog-chase-tail cycle of working full tilt for a paycheck, only to pay off debt and buy more stuff, leaving little time for us to pursue other passions in life, nary an end in sight. We were living in a cloud of delusional complacency. In the larger context of America, neither of us were big consumers nor living a main street life. We had been committed to mindful living practices for years, but even still, we found ourselves surrounded by things, that upon examination, didn’t add anything meaningful to our lives. Many of our possessions were representations of excess and arrogant privilege in the face of a majority world suffering injustice and poverty and an environment in perilous decline. We had to face the fact that we were contributing to the cycle – cogs in the wheel. Upon this realization, we settled into a depression, which led to intensive scrutiny of life choices and a plan for change. We decided to drastically minimize our belongings, pay off as much debt as possible, build a tiny, off-grid, mobile home, quit our jobs, and go on a cycling pilgrimage to reclaim our connection to humanity and the natural world. Since then we’ve worked hard and taken small step after small step toward reaching our goals. Together, we will create a life better aligned with our values, and one which will allow us to focus our energy on local and global issues that are important to us. Every day we feel the difference our choices are making. We feel lighter and less encumbered by possessions. Opportunities previously unseen are suddenly clear and available to us. We feel less scared and more at peace with ourselves. We are leading healthier, more motivated, and inspired lives.